DP World port London Gateway has doubled cargo lifting ability with a quad lift shipping crane, said to be the first of its kind deployed in the UK. 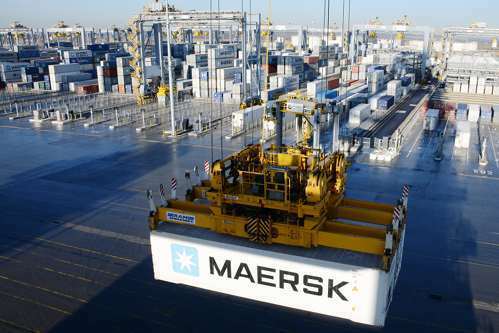 This can lift four containers at one time, which doubles the amount of cargo it can lift in one go. The spreader is capable of handling four twenty foot containers or two forty foot containers at a time, which will increase efficiency and productivity for UK shippers. Engineering Director Andrew Bowen said: "We’ve engineered a system that allows us to double the number of containers we move safely and quickly. "We have already enhanced the size of the cranes to be some of the largest in the world, capable of handling the largest vessels in the world. They also come with cutting edge automation technology,” said Bowen. In further portcentric news, The Logistics Terminal at the Port of Tilbury has continued to show rapid growth, with 2013 seeing throughput up 100% for the second consecutive year. TLT was set up in January 2011 and now deals with more than 12,000 TEUs a year across the operation of container collection, restitution and devanning, storage, cross-docking and distribution. The TLT site has grown to 150,000 sqft warehouse indoor storage, and 200,000 sqft of external hard standing, with more than 8 acres of space in all, where around 150 picks a day take place. Warehouse property - what’s in store for 2018?